I handled the T1x last week and thought it fitted wheel, certainly points well, bolt not a slick like a CF but very few rimfires are. Large bolt, great trigger, large capacity magazine and stock that fits. 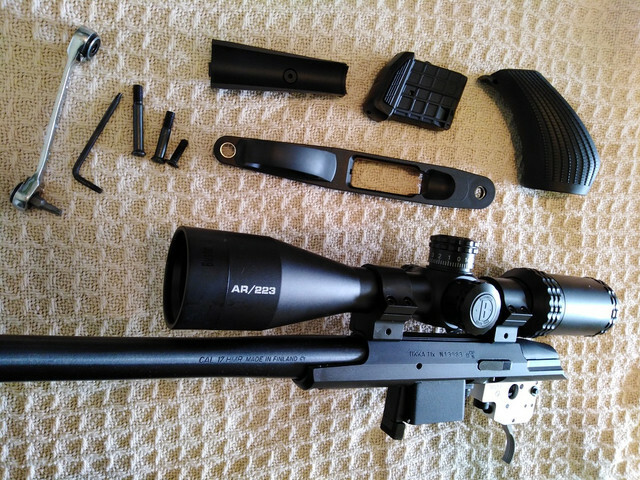 Ive had a anchsutz 22WMR and great gun but crap magazine, no capacity and cracked easliy. Had a RAR in 22LR, nice budget gun but annoying zipper like noise when operating the bolt due to machining marks, crap stock, accurate and OK trigger. Played with a lithgow and have consider , but a heavy feeling and numerous reports of crap feeding strike it off the list. Be good to see a few more range reviews with the T1x to see what it shoots like. I can't find a single mention of a T1x recall in any market in the world, no matter how I word the search string. Do you remember the reason for the recall? The recall was in Europe. Last edited by Gaznazdiak on 18 Sep 2018, 12:08 pm, edited 1 time in total. Well there you go. The more you know! Looks like someone has had more luck with one. Gaznazdiak wrote: I can't find a single mention of a T1x recall in any market in the world, no matter how I word the search string. Bump, any one on enoughgun got one of these little rifles yet? What do you think of it mate? Been away for work last week, I might get a chance to play with it mid week. 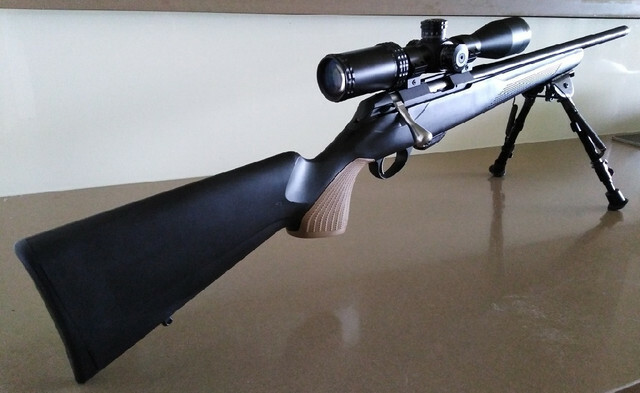 A mate has a new Savage A22R on back order, should be interesting to see if the Tikka can run with the savage. Personally I think the Lithgows are a bit bulky and with the amount of issues both the centrefires and rimfires have had it was hard to get excited by owning 1. Looks fairly neat, how's the bolt cycle out of the box? Yeah cycles good, its a short bolt not as long as a CZ or Annie, but low lift and full size handle means it just works. I was playing with a mint 10yr old CZ452 Silhouette a few weeks ago and I rate that as probably the finest CZ made, super slick and a very fine rifle, but the cheapness of the CZ mag is a let down, both have their strengths. I think the trigger on the T1x is very sweet, mag is VG but I'll wait and see how it goes on the range. Been a while since I'd visited a range, anyway I the got the barrel real warm thru both sessions, all groups shot off a Bipod with the barrel channel insert removed so it was fully free floated. Loved the consistency of the trigger, I will lighten next time. Fired 70 rounds of CCI and Hornady 17grs, every round feed flawlessly and extracted, cant fault the package for performance. Cheap Bushnell scope struggled under the indoor lighting and so did my eyes to be honest. 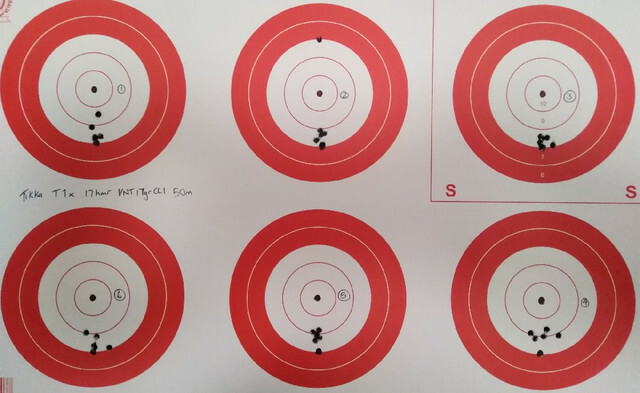 5 shot group sizes for the CCI VNT 17gr at 50m were 16mm, 10mm, 10mm, 19mm, 7mm and 18mm. I changed to a black dot on the bottom of the red circle on this target as an aiming point so dont confuse it with the bulllet holes, Bolt lift with the faster CCI was slightly stiffer. 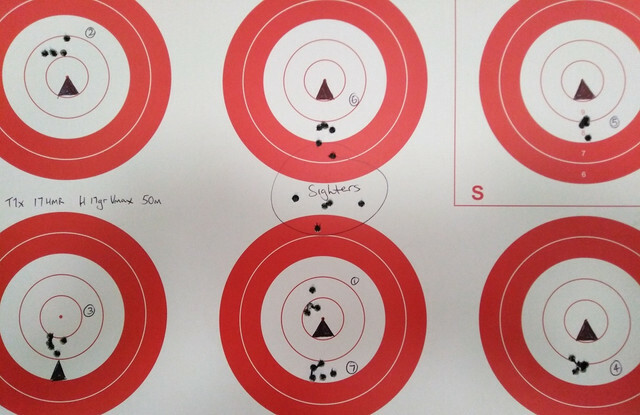 Another range session at 100m is necessary to see what the potential is, but at this stage Im pretty happy. Looks like it's a tidy little unit. I finally recieved my licence application back and I've put my paperwork in to register for the TAFE course which has fallen on the 24th of November so it's slowly getting there which is fine, maybe the 22LR will be out by the time it's all sorted.